ilan: I guess I am a critical guy by nature, and when I talk about a book in detail, it is to point out mistakes. 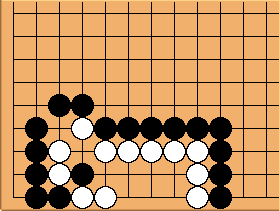 That probably explains why I haven't talked too much about Go problem books, because they seem remarkably free of mistakes, despite the incredible potential for them. 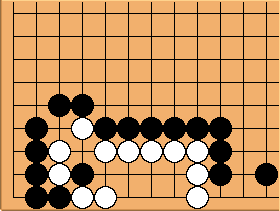 Even when I find mistakes, they usually seem to be typos, or simple errors in a diagram, e.g., Problem 96 in the book 200 Endgame Problems by Shirae Haruhiko, where a White stone is mistakenly given as Black, both in the problem and its solution. Maybe my skill level is not good enough to spot subtle errors yet, but I suspect that errors are rare because most problem books are written by professional players for whom correct reading is a way of life. Not too interesting or beautiful, but it seems to get the job done quicker, which might prove important if there were a ko fight somewhere else. unkx80: This problem obviously uses an existing theme that is fairly commonly seen in life and death problems, but the problem is composed very carelessly - in order for the beautiful theme to shine, we must give the White group at least one liberty outside. 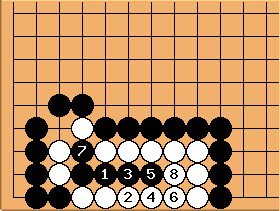 I guess this problem was composed by intuition but the author forgot that there may be other possible variations given this instance of the theme. Bill: Or perhaps there is an error in the diagrams, which is easy to fix. Because of these defects, I must say that I find this book fairly disappointing, though I believe in the principle that books with mistakes are good because they make you more aggressive in questioning solutions and trying to find alternate ones. The reason is that the book contains no explanatory comment on any problem and in every case, only one variation is given. This brings up the question of a problem book author's responsibility. The Japanese problem books definitely have a lot of commentary next to the problem diagram, though I don't understand any of it, and I have wondered how one could write so much about a problem diagram. The solutions almost always contain the main correct and main incorrect variations, and the answers sometime span up to four pages. In other words, the Japanese authors are certainly doing a lot of work. It is true that English problem books may be more succint, but the difference is that while some standard English problem book don't give much commentary, they contain hundreds of problems, as opposed to this book, which is only 40 pages long. ndkrempel: I've also noticed that solution 47 in the elementary problems section is incorrect - it should be ko. 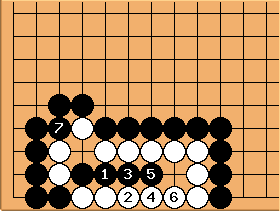 Problem 27 in the intermediate section is wrong too - black cannot save his stones. 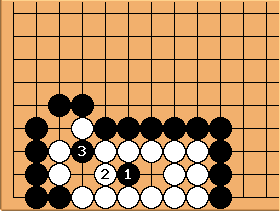 Problem 12 in the advanced section gives a ko as the solution when a simpler move kills the group without ko. Having said that, some of the other advanced problems (notably 6, 11, 17) are very beautiful and I haven't seen them anywhere else before.